Met a friend at KLCC for a catch up chat so we went to Du Viet where it is nice and quiet. 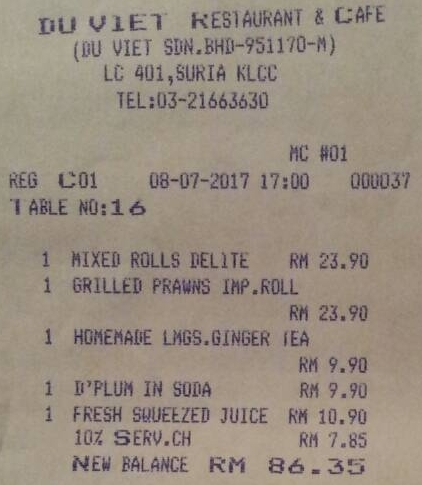 I ordered a plate of mixed rolls to share at MYR23.90+ (10% service charge, MYR26.30 nett). Quite tasty. 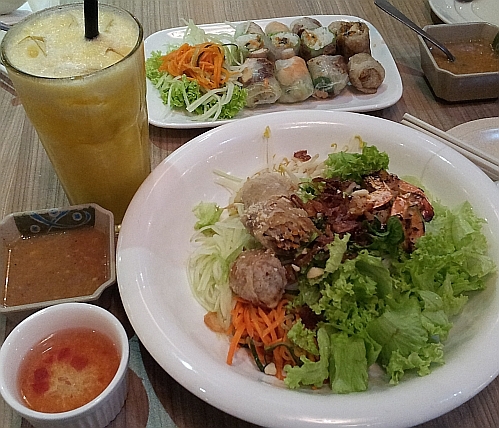 My lunch - prawns vermicelli dry - MYR23.90+ (MYR26.30 nett). I ate slowly for 2 hours while we talked and finished all my food and drink without feeling too full. I am glad that they served the sauces/dressings separately without me asking them to. I did not use much of the sauces, just ate the vermicelli and vegetables as they were. The glass of fresh pineapple juice is very refreshing at MYR10.90+ (MYR12 nett) without any added sugar. 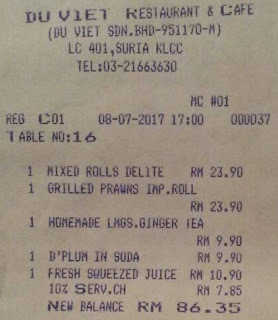 Total Bill is MYR86.35 nett - my treat since my friend did not eat much. I'd love this! Love those Vietnamese rolls. I still not acquired to the taste of Vietnamese spring rolls. Hehe. which taste that you don't like? I was always wondering why the Chinese only have popiah rolls and not those Sushi, Kimbap and Viet rolls. Vietnamese food is really different and original. bakchang is chinese sushi and kimbap I guess. ccf rolls are like vietnamese rice rolls I think. Both the dishes look good. Have a good day! they taste good too. Hope you have a good day too! Lots of vege so you may be able to finish it by yourself. 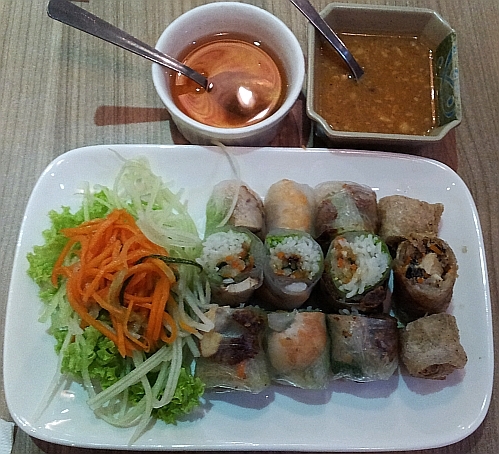 i like Vietnamese rolls, they are so refreshing & green coz of the stuffed veggies. I love those mixed rolls! Those rolls look so good. I never tried making them myself but I do love them lots. I think you would be able to make them yourself with no issues. good that you think so.